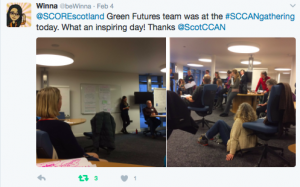 The Scottish Communities Climate Action Network (SCCAN) held its Annual Gathering 9.30-4.30 on Saturday 4 February 2017 in David Hume Tower, George Sq, Edinburgh EH8 9JX. 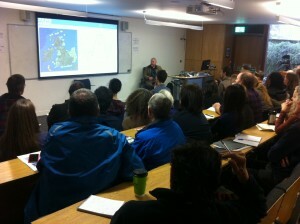 It was a day packed with inspirational talks and workshops. Paul Allen, Director of the Zero Carbon Britain project at the Centre for Alternative Technology (CAT) in Wales, gave a keynote address on their Zero Carbon – Making It Happen research. 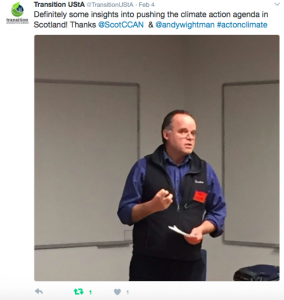 Andy Wightman, Green MSP, joined as a Keynote Listener, and provided an inspiring conclusion to the day, sharing ideas on the Community role in delivering low carbon aspirations. Room 11 Building regional momentum. 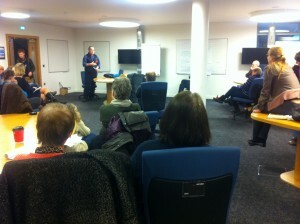 Learning from Fife CCAN network. FCCAN coalition) and Eva Schonveld (SCCAN steering group member) to find out more about the FCCAN experience. We will go into more detail on the successes and challenges of the project and will also ask for your help in planning how similar regional networks elsewhere in Scotland could be initiated and/or supported in the future. Room 7 Climate (In)Justice and You. interactive workshop that you can take away and use yourself to stimulate/revitalise community engagement. Led by Pam Candea (The Surefoot Effect). 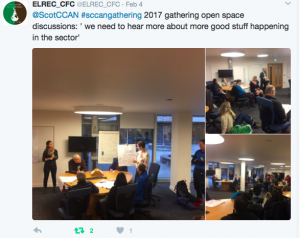 Room 9 Community Energy and Enterprise – sketching out the new normal. Room 7 Transition Resources: group health check with Alan Brown and Maria Cooper. Introducing the transition network resource toolkit to healthcheck your initiative. Members of transition Scotland (regional hub) will take workshop participants on an overview of the key elements that should be balanced well to ensure your initiative/group remains healthy and able to thrive and adapt to changes that develop over time. 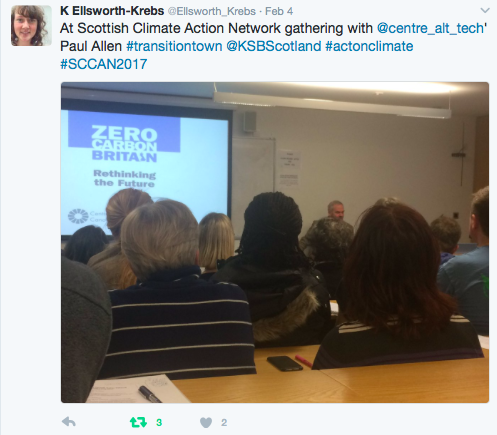 Open to all Scottish Communities CAN members not specifically for transition groups. Free to use resources from TN international organisation. Take a walk in the community activism woods and encounter your transition animal face to face. Will you survive? Come and hear short presentations from different SCCAN members, sharing about their projects, successes and challenges. 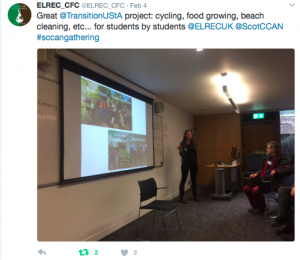 Room 11 Climate Resilient Communities – Weathering Change. 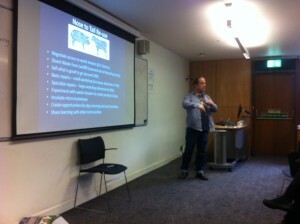 2.45 – 4.00 Room 7 Open Space. Open Space is your chance to talk about the issues that are most important to you. The focussing question for this session was: “What are our wise next actions in growing our low carbon, resilient Scotland?”. 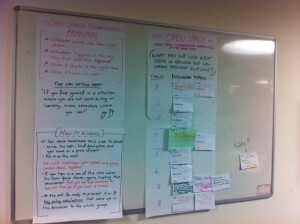 Here’s a description of how Open Space sessions work, for those who haven’t done it before. Continuation of discussions and exchanges in Southside Social (pub around the corner).